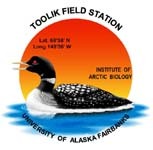 » Phenological stages of deciduous plants were observed at a long term experimental moist acidic tussock tundra site, Arctic LTER 1996 Toolik Lake, AK. Plots were setup as indicated below, with annual fertilization treatments of 10 g/m2 Nitrogen (as NH4NO3) and 5 g/m2 Phosphorous (as triple superphosphate) . Greenhouses and shadehouses were annually set up in early June and removed in the end of August. Notes: The longest leaf was not measured in the wet sedge plot on the plants monitored for phenology. Snow covered the site before measurements were made. See 96gsgrow.dat for leaf length for Carex rotundata and Eriophorum angustifolium. Calculations: No calculations, all data in date format. Moist Tussock Tundra: Betula nana, Ledum palustre, Vaccinium vitis-idaea, Carex bigelowii, and Rubus chamaemorus. Three groups of individuals of each species were randomly selected within each plot. An individual of each species was tagged and used as the center of a 15cm radius monitoring circle. The monitoring area for C. bigelowii was a 50cm circle, due to its relative rarity in the plots. Individuals 1-3 were in Block 1, 4-6 in Block 2, etc. Plots were visited every 2-5 days and the dates in which phenological stages occurred were noted. New stem growth of Betula, Ledum, and Vaccinium was defined as the distance between last years bud scar and the tip of the apical bud. These measurements were taken on the most apical branch of a randomly selected individual within the monitoring circle. The longest leaf on this year's stem was measured from the base of the petiole to the tip of the blade, for these three species. If an individual of Carex was flowering within the monitoring circle, then the length of the longest leaf of that individual was measured from the top of the leaf sheath to the tip of the blade. The inflorescence culm was also measured from the top of the leaf sheath to the tip of the blade. If no individuals were flowering within the monitoring circle, then a randomly selected tiller was measured for leaf length. The longest leaf of a randomly selected Rubus was measured from the point of attachment to the stem to the tip of the central lobe. Measurements of maximum growth were recorded on August 19th. Version 3: Upadte LTERNET Data Access server proxy link for Excel and comma delimited data files. Changed from knb to das in url. Version 4: Updated metadata form to newer version (without site sheet). Fixed discrepency with header variable names. CH 24 Jan 2013 Updated to newer metadata with site sheet. CH March 2013.